Now up: the one and only Aaron Nagler from over at Cheesehead TV. Robert and I are honored that Aaron was able to take time from his prodigious tweeting, feeding the info-hungry Packer masses with new blog posts, and hob-nobbing with the NFL media-elite at the NFL Draft Combine to answer some questions. Aaron definitely kept up the high standard that Alex and Brian set before him. 1) If you woke up in the middle of the night, and Ted Thompson was standing over your bed watching you sleep, what would you offer him to drink? (that's the polite thing to do) Why? Definitely a Newcastle Brown Ale, because it’s all I’d have in the fridge other than approximately a thousand juice boxes. I’ve been told Ted doesn’t imbibe, but damn it, if he’s going to wake me up in the middle of the night, he’ll take what he’s given. 2) What's your favorite '80s hair band, and how do you relate them to the Packers? (this is relative, you may hate 80's hair bands, but if you had to choose one, who would it be) I do indeed, and did then, hate 80s hair bands. But the obvious answer here is…um…Ratt? Because the Packers make the world go…Round and Round? 3) Which cheddar is beddar: mild, medium, or sharp? Subquestion: How the hell does California think they can make cheese? Sharp by a mile. California thinks it can do a lot of things – and then realizes it has no money and has a faded action star as its Governor. Wisconsin, on the other hand, knows what it does well and sticks to that. Cheese, beer, brats and, of course, Packers football. 4) If John Rambo, in his prime of First Blood Part II, played for the Packers, which position would he play? Is he Pro Bowl material, or just a serviceable player? I’ll take the second part first – not only is he a perennial Pro Bowler, he’s a first Ballot Hall of Famer. Like Bart Starr, he was a nobody until he found someone who believed in him. For Starr it was Vince Lombardi, for Rambo it was Sam Trautman. As for what position he would play – very, very Strong Safety. 5) Ty Webb or Jeffrey Lebowski? I already know the answer to this, so who's your favorite subcharacter: Bunny, Jackie Treehorn, Brandt, Karl Hungus, Woo, Knox Harrington, or Larry Sellers? How do you leave Jesus Quintana off this list? 8 year olds dude. 8 year olds. 6) If you woke up tomorrow and the Packers ceased to exist and no one but you remembered them, how would you convince everyone they are the greatest organization in sports? I would tell them about the last time I ever saw my grandmother, my mother’s mother, Violet Rose Wilson. (Yes, Violet Rose) – I would tell them how the last time we ever had lunch together I learned more about her than I had ever known and all because we talked about the Packers. She told me the most amazing story of going to watch the Packers play back when they were still playing in a farmer’s field. Have you seen the opening scenes of Leatherheads, where George Clooney and the pro teams are playing ball with a bunch of cows watching while the college game is being played in a huge stadium? That was EXACTLY the picture she painted at that lunch. That conversation meant more to me than anything. It happened while I was still in college down in North Carolina, over Thanksgiving break and she had passed by the time Christmas came along. I will never forget how close we were that afternoon. And it never would have happened without the Packers. 7) Don Hutson basically invented the receiver position, what's your favorite invention: the Cheesehead, the truck-bed tailgate, or the Green Bay Sweep? While tailgating is fun and the Sweep is awe-inspiring, I have to go with the Cheesehead here, both for the obvious reason and because a Cheesehead once saved a man’s life in a plane crash. True story. 8) Corey seems to be a shadowy figure that appears during Cheesehead Nation broadcasts and then retreats to his lair, if you could compare the two of you to a Superhero duo, who would it be and why? Well, there’s nothing SuperHeroish about us. Not even remotely. I think we’re probably closer to Vladimir and Estragon. Only instead of waiting for a title character that never shows, we’re waiting hopelessly for the NFL Network to give us a ton of money to do our show. 9) Say the internet died tomorrow, I'm talking a gruesome, bloody death. What would you do with your spare time? (I think you may have a lot of it. Lol) Lol? Who are you, Nick Barnett? I’d probably get a lot more done. 10) Lombardi. You have expressed your and Corey's desire to be in the film, and seeing as how you made it to the NFL Combine, I have faith that you somehow will be. However, the only spot left in the film is playing a schlub being drilled by Ray Nitschke (who I personally think should be played by a bulked up Timothy Olyphant. Thoughts?). However, the take isn't going right, and it has to be done over and over and over and over... You don't get a stuntman, extra, how many hits could you take? First off, love the Olyphant idea. (Anything to get him out of a damn cowboy hat. Justified? Really?) As for the role and number of hits – Over/under is set at 2. I’ll let the readers take what they will. 11) Last but not least, other than Tim Tebow, what's the oddest thing you saw at the NFL combine? John Clayton's hair. Fantastic answers, all of them. I would be completely and utterly convinced of the greatness of the Packers after hearing about the afternoon with your Grandmother. Great, and touching story. Do you think Godot will ever show up? The waiting is the hardest part. 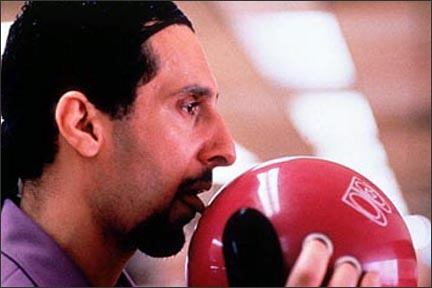 In my defense, Aaron, nobody f%&*s with the Jesus, and I always thought John Turturro turned him into a major character. But, yes, 8 year-olds, Dude. Ted Thompson as the Sleep Watcher? After waking to Ted standing (cross-legged) at the foot of your bed, and noticing that he has a light grip on your toe; you might think he wants something to drink. . . .But you'd be wrong my friend. Ted only wants to . . . watch . . . you . . . sleep. Intense? yes. Creepy? yes. Appropriate? no. But there you have it, Ted Thompson; sleep watcher. That was classic. Thanks Aaron for doing this! Love the Rambo answer, among others. Now that the 2 of you have made it big time in the blogosphere I will begin posting my comments using my true identity. After winning an Oscar for Crazy Horse this year "Asked to comment on a career that's had plenty of failures and has now achieved the ultimate success, Bridges quoted his most famous movie role. "I've had ups and downs," he laughed, staying as humble as always. "What does the Dude say? Strikes and gutters, man!" "
"John Clayton's hair" I love it! He lived up to the billing - I'll give him that! I just read this again, and damn, this is fun!